We asked Kipperman, is sustainable fishing possible? One of the myriad reasons we decided to go meat and fish free for 2016 was our concern about the current global fishing model. Should it continue, the oceans are projected to be completely devoid of fish and seafood by 2048. This Greenpeace video about how sustainable, small scale UK fisherman are disappearing highlights the implications for ecology, culture and economy. The Last Fishermen from Greenpeace UK on Vimeo. Where do we go from here? Do we all need to completely eradicate seafood from our diets, to protect our oceans, or is there a way we can continue to enjoy eating fish, sustainably? If there was ever a man qualified to answer our questions, it’s Shambala legend, Kipperman. Mike Smylie AKA Kipperman is the author of a whopping 23 books on commercial fishing and writes regularly for fishing industry publications. 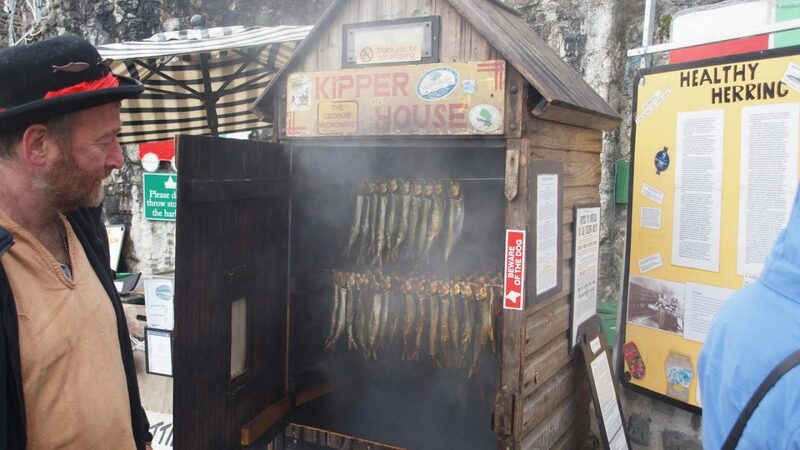 He has also been exhibiting Kipperland and the Amazing Travelling Kipperhouse for 20 years – producing some of the best kippers on the planet, all from sustainable supplies of herring. You will see him offering insights at Shambala again this year. Q. Is sustainable fishing possible? A. Of course – but only if the rules of the game are altered. “We’re living on a knife-edge now, so it’s basically now or never,” said fisherman James White of Felixstowe Ferry in the Greenpeace film The Last Fishermen. No truer words reflect the state of the British fishing industry after years of upheaval and now the time for change is upon us. So, first, what exactly is sustainable fishing then? Surely this means to keep stocks at a fixed level so that none are exhausted nor the environment damaged. With large scale fishers taking twice as much fish than the oceans can support, this doesn’t appear anything like sustainable. Something is obviously wrong; we know that. What we don’t know is how to change it. Um..what?! Of course we do know. Small scale fishers throughout the world outnumber large scale ones by about 19 to 1 whilst in Britain it is around 78% of the whole (2010 figure) that work small scale. They use traditional age-proven methods, leave a much smaller carbon footprint, sometimes even working with sail and oar, and are mostly from generations of fishing families. They bring fish ashore that has quality versus the quantity of the big boys. They have learnt from an early age to respect the sea, have grown up around it; they have a deep understanding of the importance of it. Contrary to them are many of today’s deckhands aboard the large boats; people from all over the world who simply end up on the deck through the need work (and receive poor wages for the pleasure). It’s just a job that needs no respect for the sea or what’s in it. Quota is the amount of fish a country allows its fishermen to take from the sea. Yet the British small-scalers only receive 4% of the British quota, the other 96% being handed out to the large scalers with their big factory ships and high-tec trawlers, owned by powerful companies who can afford to pay for clout within political circles. That’s just not fair and results in small scale fishers not having a chance and being slowly being squeezed out. With an in/out EU referendum looming, you can argue for all you like about the fairness of a Common Fisheries Policy that allows Britain to take 30% of the fish in its territorial waters, but that alone is one huge reason why the big boys have been allowed to gain ascendancy. Money speaks, and when quota is bought and sold, it’s hardly surprising they’ve the upper hand. To tip the balance we need small scale fishers to keep fishing sustainably and it’s time for the quota balance to be increased in their favour. We, as consumers, need to demand that supermarkets and shops only stock fresh fish from these fishermen. Not eating fish it is not an option because these fishermen need our support. In time only our actions can turn the tables on ruinous fishing and lead us to regaining healthy seas. You heard the man, Shambalans – we can still pull back our oceans from the brink, if we act NOW by voting with our wallets and refusing to pay for large-scale, trawled and unsustainably sourced fish. Let’s do this – as another Shambala heavyweight in the arena of food Sustainability, Ed Gillespie, put it, ‘we are activists three times day with every mouthful we take”.